Even with just a passing knowledge of marijuana, you probably know terms like strain, joint, and edible, but if you’re plunging into the cannabis world for the first time, you’ll likely learn a whole new lingo in the process. Gia Morón, executive vice president of Women Grow, an organization focused on women’s leadership in the cannabis industry, says that it’s normal to be intimidated when schooling yourself on all forms of cannabis jargon—but don’t be. “When I first entered the industry, I had no idea what these terms meant,” she says. 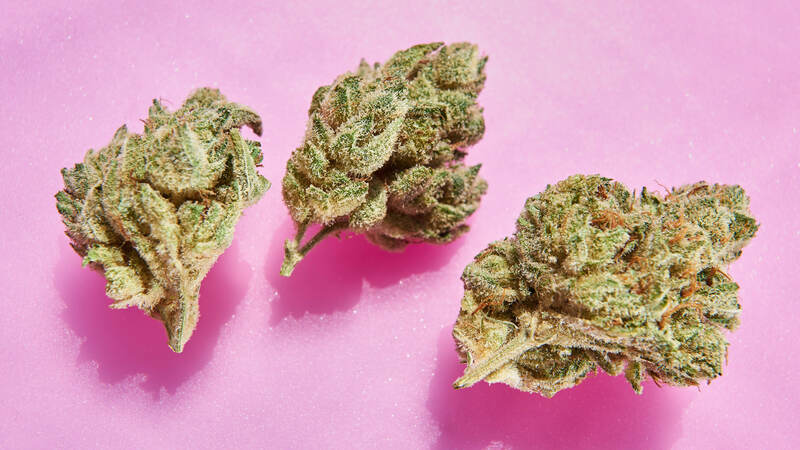 “I am still learning today.” With that in mind, read on for a breakdown of some common cannabis terms you should know. Cannabinoid: Cannabinoids are the chemical compounds found in the cannabis plant. They’re secreted by the cannabis flowers, and are responsible for many of the things cannabis is known for, like relieving pain, and fighting inflammation. Two of the most common cannabinoids are THC and CBD. Cannabis Sativa, Indica, and Ruderalis: Sativa, indica, and ruderalis aredifferent strains of the cannabis plant. Indica is known for its relaxing effects, while sativa is usually more invigorating. Ruderalis, on the other hand, contains a higher CBD content than indica or sativa, and isn’t quite as popular for recreational use. CBD: CBD, the cannabinoid having a major moment right now in wellness, beauty, and beyond, won’t get you high, but it’s known for being calming and soothing — hence why it’s been used as a painkiller and for reducing anxiety. CBDa: CBDa stands for Cannabidiolic acid, and it's the primary cannabinoid found in the flower, leaf, and stem of a cannabis plant. Morón says that CBDa goes through a process of decarboxylation (when carbon dioxide and hydrogen are removed), and the acid disappears and turns into CBD. CBN: Another compound found in the cannabis plant, CBN stands for cannabinol. CBN is similar to CBD in that it doesn’t get people high. However, it does have a sedative effect, and Morón says it’s sometimes used to help quell insomnia. Hemp: You likely have a bag or two around the house that’s made out of hemp. Though it’s a cannabis subspecies, hemp has mostly been bred for fibers. Psychoactive/Non-psychoactive: Psychoactive means that you’re getting high on an intoxicating substance; non-psychoactive indicates that you aren’t. While people often say that CBD is non-psychoactive, they usually mean that it’s non-intoxicating, meaning it doesn’t cause the high that THC does. Sublingual: The Latin term for “under the tongue,” which is where a pair of small salivary glands are located, sublingual is a method of administering a substance into the bloodstream via the tissue located beneath the tongue. When ingesting cannabis in tincture form, it’s recommended to drop the oil under the tongue, hold for 30-60 seconds, then swallow. Terpene: Terpenes give plants (including, but certainly not limited to, marijuana) their distinctive smells and flavors, which can differ by plant type. Limonene and Myrcene are just two of the 100-plus terpenes commonly found in cannabis. THC: The primary cannabinoid found in cannabis, THC stands for tetrahydrocannabinol, and is the ingredient that gives you the high that’s typically associated with marijuana usage. THCa: An acronym for Tetrahydrocannabinolic acid, Morón says THCa isfound in raw cannabis, and is notintoxicating. Once extended heat is applied to THCa, it then becomes THC. Tincture: A tincture usually refers to a medicine made by dissolving a drug in alcohol. Cannabis tinctures are typically comprised of an oil extracted from the plant, taken orally. Topical: A topical (cannabis-addled or otherwise) is any cream, oil, or any product form that is not orally ingested, but is instead applied to the surface of the skin. Trichome: Trichomes are the hairs found on the plant, and usually have a fine, white, crystal-like appearance; they’re responsible for the unique cannabinoids, terpenes, and flavonoids contributing to the flavor and potency of a particular cannabis strain. Their appearance can indicate the life cycle stage of a cannabis plant, indicating to growers a plant’s peak ripeness.